According to statistics, tuberculosis (TB) is an infectious disease that is responsible for affecting the greatest number of people and has the highest fatality rate in Formosa. Primarily the financially disadvantaged are the most vulnerable. Professor Lai Hsin-Chih and his research team at the Department of Medical Biotechnology and Laboratory Science, Chang Gung University, recently developed a low-cost TB test stick which takes just a few minutes to detect the disease and it only costs NT$50 per unit (approximately US$2). With this new technology, TB can be easily identified at an earlier stage, thus greatly alleviating the suffering of the patients. 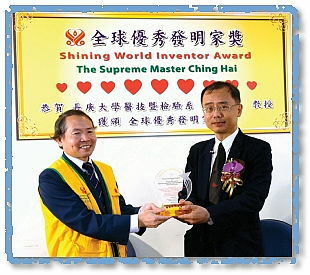 To commend Professor Lai Hsin-Chih for his outstanding achievement in medical biotechnology, Supreme Master Ching Hai honored him with the Shinning World Inventor Award, which was presented to him at Chang Gung University on May 21, Golden Year 7 (2010) by our Association members. 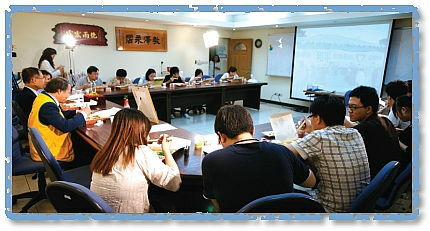 After the Award presentation, Professor Lai and all the guests enjoyed vegan snacks lovingly prepared by our fellow initiates. Surprised by this formal recognition, Professor Lai humbly expressed his heartfelt gratitude to Supreme Master Ching Hai for the Award. More than twenty associate professors, assistants and students were present at the ceremony. At that time, our Association members also took the opportunity to share with them Master’s publications as well as some informative material related to climate change. Our sincere thanks Professor Lai Hsin-Chih for your innovation in medical technology, that helps create a healthier future for humanity.